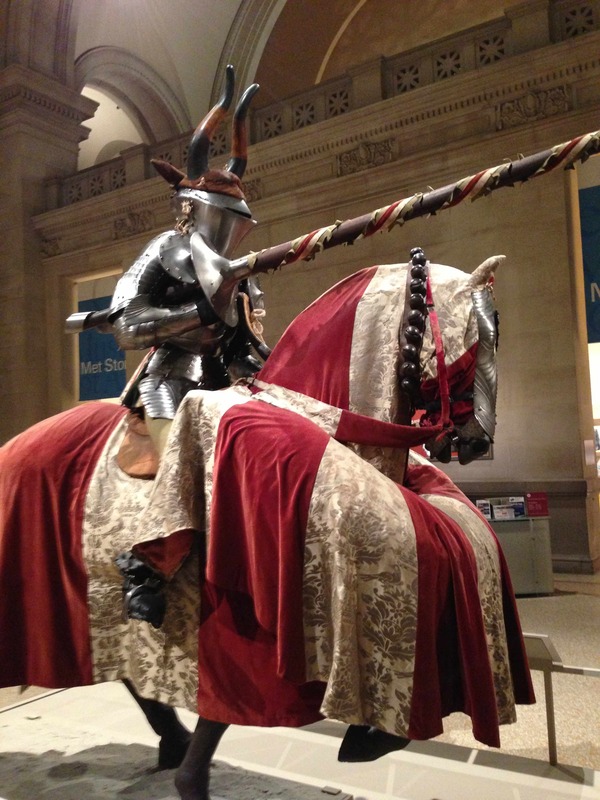 After a brief Yuletide absence, the spectacular Armor for the Joust of Peace has been returned to the Great Hall of the Metropolitan Museum of Art, just inside the main entrance, to honor 100 years of the Arms and Armor Department. Not seen in all its splendor since the 1980s, you’re looking at what extreme sports dressing looked like back in 1500. It all took place as the Renaissance was dawning across Europe, so this outfit was designed for safety and sport – not combat. The objective: unseat your opponent during a horseback charge across an open field with a blunt lance. 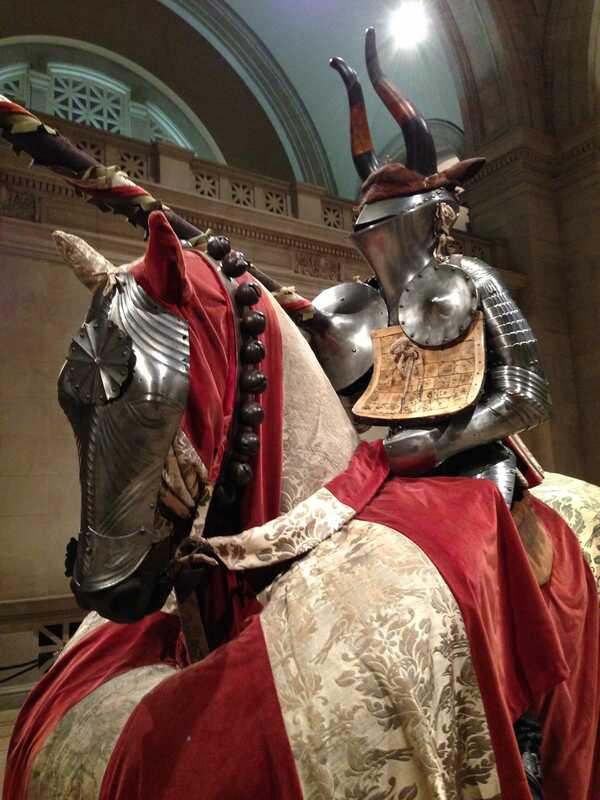 Jousts happened on open fields without barricades to separate the horses, so the horse’s head armor completely covered its eyes (yes, galloping blind). A straw-filled bumper hung around his chest for protection. This jouster’s wear was super-heavy (over 80 pounds for the body and 21 for the helmet), with the padded helmet physically bolted to the body armor to protect against whiplash when the inevitable impact occurred. The Met’s first curator of arms, Bashford Dean, found this German ensemble (even though some pieces were missing) and purchased it in 1904, setting the stage for many, many subsequent acquisitions (oh, about 14,000 more). It lacked an original helmet, but when Dean saw the one on display (an 1891 recreation made by Parisian armorer superstar Daniel Tacheaux), Dean not only snapped it up, but hired Tacheaux to be the Met’s first armor conservator. 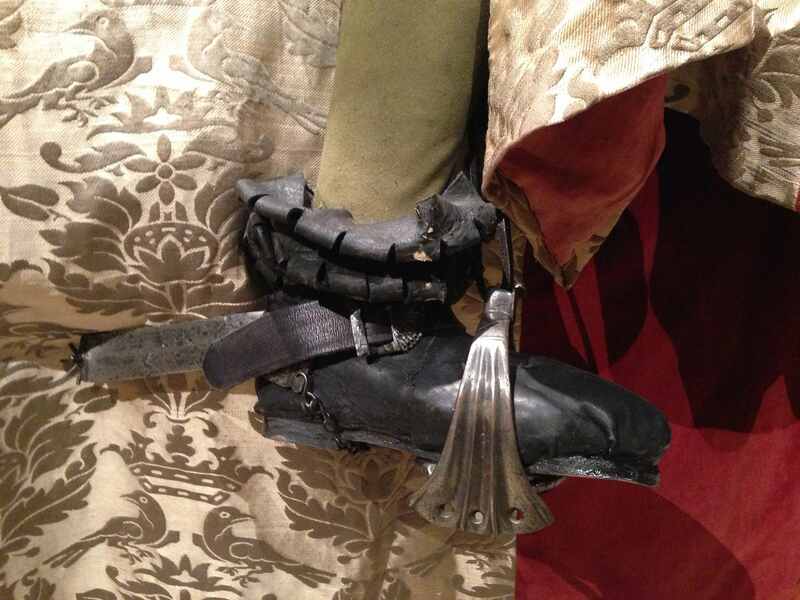 The shield and upper-thigh protectors are also restorations, and so is the horse’s brocade and velvet. But standing so close to this magnificent mount below the arches of the Great Hall, it’s easy to imagine you’re hearing the hoofbeats and roar of the sports crowd, and know that it’s not coming from the gift shop. This entry was posted in Art, Fashion, History, Museums and tagged arts, culture, design, fashion, history, museums, textiles by mssusanb. Bookmark the permalink.